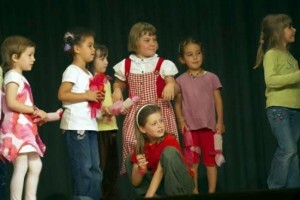 The first school play. I remember sitting in the audience as a parent when my own children were little and attending Sunshine preschool here in Switzerland. 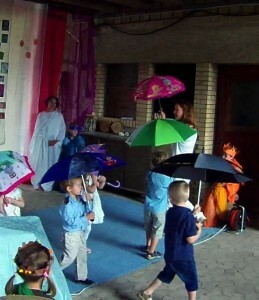 My older son, who was four at the time, played the role of the farmer as the class performed the song The Farmer in the Dell. And hi-ho-the-derry-o, he spontaneously chose none other than his little three-year-old brother to be his wife. Like any proud parent I was bowled over by the adorableness of my beloved offspring. If this were the sole benefit of participating in the school play it was well worthwhile. Yet, despite having a background in dance and theatre myself, it wasn’t until I began teaching that I realized the real efficacy of the theatre arts as a tool for holistic learning. When I started working with children, both preschool and school age, it was like a great homecoming for me. I had finally found my tribe. I had worked for years with actors and dancers choreographing dances and putting on plays. I loved the entire process of creating and producing performances. It required me to use all of my capacities in the service of something larger. Coming up with ideas and developing them was always a rich and varying interplay of textures, shapes, rhythms and impressions of the moving body, and the emotional, aesthetic and musical selves, all gently guided by intuition and intellect. And because I always worked in collaboration with other dancers and artists, I could add the interpersonal and social aspects to the mix as well. It was definitely a holistic enterprise. At Sunshine, we use theatre to create a rich integrated learning environment for both the children and teachers and to foster a sense of community within the school at large. This co-creative laboratory becomes a scaffolding on which to hang our ideas, a loom with which to weave the threads of our experiences into a meaningful whole – a tapestry of life. In making a theatre piece we frame and contextualize our daily activities – our songs and dances, our stories and games all become raw material for the performance. We see how everything is related to everything else and how it all can come together into a meaningful whole. Movement and dance are key ingredients in any play and provide opportunities for developing the physical body as well as spatial awareness, imagination and aesthetic sense. 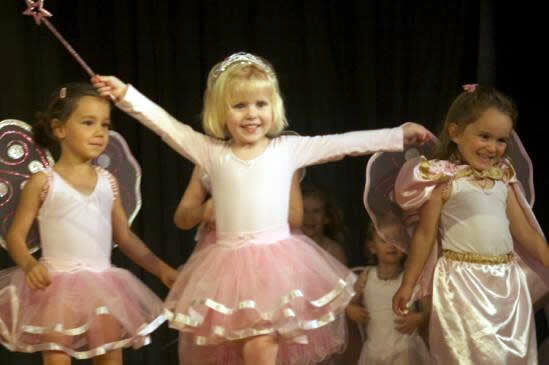 With little ones, this is pretty obvious yet with older school-aged kids, movement and dance are often the first enterprises to be abandoned in favor of the more cognitive and verbal aspects of drama. 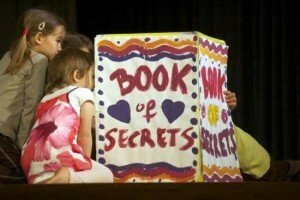 As soon as kids are reading, very often the school play becomes merely a demonstration of each child’s ability to read and memorize text. This need not be the case. 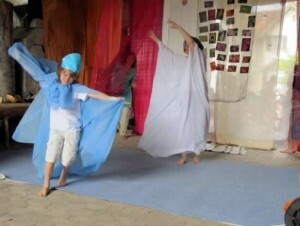 In the picture for example, seven-year old Luc dances the role of the wind. His classmates play water, fire, earth, and ether. Water and fire combine to make steam, earth and fire to make lava. A science/social studies lesson is brought to life in full living moving color and woven into our play, The Circle of Love. Music is another fundamental element that contributes greatly to any play and supports a child’s development in myriad ways. In and of itself music covers the bases expressing the color, rhythm and tone of all aspects of life. Coupling fine gestures with song aids in memory and comprehension and provides an opportunity to practice fine motor skills. 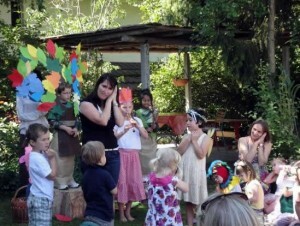 Teacher Gabi, leads the children in a tender German lullaby as part of our show The Giving Trees. Three little monkeys from a summer performance of the classic story Caps for Sale are getting English lessons as they tap out the rhythm of the text on their hand-made drums. We bring in the visual arts and crafts as we create our own costumes and props. Handicrafts support the development of fine motor skills and working with shape, color, and texture requires our creativity and develops our aesthetic sense. Through making and wearing his own costume a child encounters the characters and the narrative of a story from a different more embodied perspective. 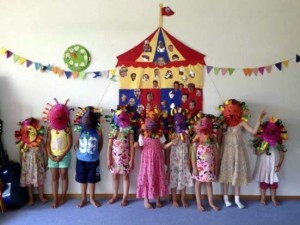 A group of young lions show off the colorful expressive masks they made for their role in our production of Circus Sunshine. The big wall mural was an on-going group effort by all of the children and teachers. 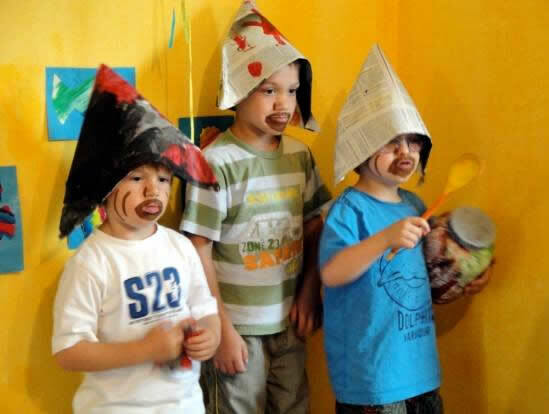 A play tends to have an overarching story line as well as possible smaller narratives lines within, both of which offer opportunities for language development and dramatic role play. When children listen to and dramatize a story, they learn empathy as they embody a character, literally walking in someone else’s shoes, or perhaps wearing someone else’s hat! Having lines to speak gives kids a chance to show off their language skills as well, especially for those learning a second language. Simply being able to follow a story line and respond to cues is a wonderful practice in self-regulation supporting cognitive development. What story do we want to tell? For us at Sunshine, the story line of a play is very important. 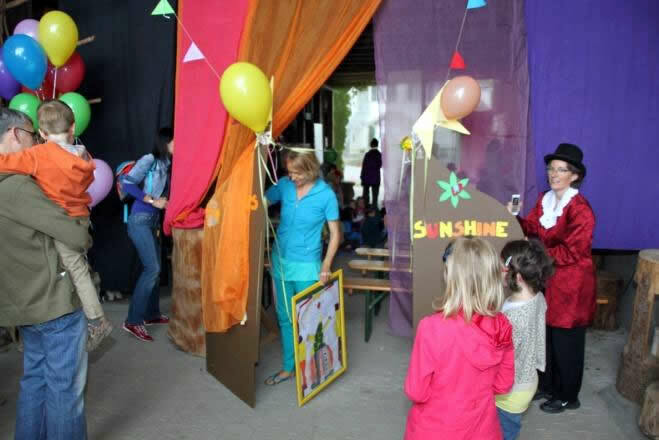 The content of the play is arrived at differently each year and is always a collaborative effort by all of the teachers, skillfully guided by our director Tatjana Popov. Each narrative emerges from our circle-of-love curriculum and is an expression of some aspect of our universal neohumanist values. For instance, a few years ago, with a strong verbal group of English speakers and a chance to work on a large community stage, we were able to mount a lovely production of the neohumanist favorite The Fairy’s Flowers which explores the ten moral principles of yama and niyama. The launching of our nature playgroup some years later inspired us to imagine a more earth-centered and sustainable version of the American classic The Giving Tree which we performed outdoors at the farm where our nature playgroup meets. Circle of Love, based on a poem written by Tatjana was a recent ambitious attempt to bring to the stage a telling of a neohumanist creation story in a way that children could understand. Our most recent endeavor, Circus Sunshine centers around Frogo, a frog who runs away to join the circus. As he attempts to participate in the various circus acts, he discovers and learns to appreciate his own unique gifts and talents by listening to his own inner voice. 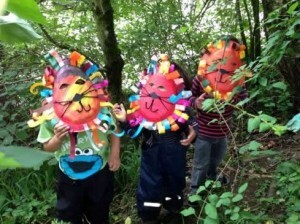 Back in the classroom and in the forest the integration of the material continues as the lions spill off the stage and into their natural habitat and the children practice inner listening skills and paint pictures of their inner voices. Perhaps the greatest benefit offered by the collaborative process of performance making is that it offers something for everybody. To quote Shakespeare again, “All the world’s a stage…” And as I see it, all the stage is a world. Like Frogo, every child has unique gifts to offer the world- some ripe and ready to be picked and offered, others still held tight in the bud, needing water and sunshine and time to bloom. Some obvious, some hidden. For instance, I remember fondly, having a breakthrough with one particular child who I found generally rather challenging and increasingly disruptive. When we began focusing on our play, this child came alive. She was full of wonderful ideas and finally had the perfect circumstances to put them to positive use. Suddenly I saw her not as bossy and overbearing but as a creative and inspired little director in the making. As we work toward a common goal, cooperation and harmony increase and our sense of community begins to deepen. Each child and teacher begins to find his or her place of contribution. We endeavor to highlight the strengths of all while creating a safe container to experiment with less developed more challenging areas. When the day of the performance arrives, energy and anticipation are high. 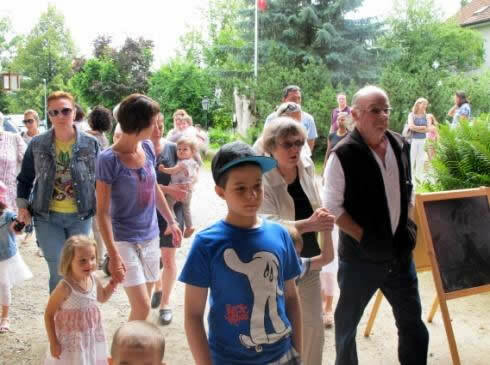 As the teachers and students are busy readying themselves, our families and friends arrive with platters and plates full of delicious offerings for the pot-luck lunch we will enjoy together afterwards. Through our theater play we share our Sunshine world with those we love and bring it into the larger context of the children’s lives. We offer parents a glimpse of the totality that is the Sunshine experience. What we do, how we do, and why we do it. Our plays are a mirror of our little Sunshine world and of our hopes and dreams of what a healthier more just and beautiful world at large might look like.